The US president, Donald Trump, has approved declaring the California wildfires a major disaster, the White House said on Sunday, and ordered federal aid to be provided. His move, which will make federal funding available for the most stricken areas, comes after California governor Jerry Brown called for federal help. It comes as the wildfires in northern California have spread to more than two-thirds the size of Los Angeles as more residents were ordered to evacuate their homes. In a statement the White House said: “Assistance can include grants for temporary housing and home repairs, low-cost loans to cover uninsured property losses, and other programs to help individuals and business owners recover from the effects of the disaster. Firefighters endured high temperatures and gusting winds as they attempted to contain two blazes known as the Mendocino Complex raging around Mendocino, Lake and Colusa counties, about 90 miles (145 km) north of San Francisco. The fires had grown to cover about 229,000 acres (82,675 hectares) by Saturday night, and were considered 32% contained, according to the California forestry and fire protection officials (Cal Fire). Brown, who visited some of the burned areas on Saturday, said the increasingly long fire season was the “new normal, that we’ve got to deal with”. But he was confident the president he has clashed with over immigration and pollution policies would send aid, which Trump did last year when California’s wine country was hit hard. The Mendocino Complex is now considered the sixth-largest wildfire in California’s history. Four of the state’s largest six fires have occurred since 2012. This year, Californian wildfires have burned more land earlier in the fire season than usual, the Cal Fire director, Ken Pimlott, told a news conference on Saturday. 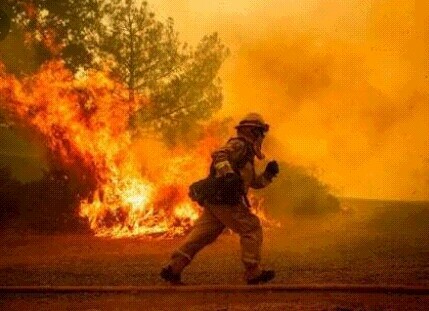 “Fire season is really just beginning. What seems like we should be in the peak of fire season, historically, is really now the kind of conditions we’re seeing really at the beginning,” said Pimlott. Californian fires last week had torched about 290,000 acres (117,300 hectares), more than double the five-year average over that same period, according to Cal Fire. The Mendocino Complex fires cover an area 71% of the size of Los Angeles. They have forced the evacuation of more than 20,000 residents and destroyed more than 100 structures. More evacuations were ordered on Saturday afternoon, but no estimate of people involved was released. The fires have swelled to become larger than the deadly Carr fire, about 100 miles (160 km) to the north-east, which has killed at least seven people and destroyed more than 1,500 structures. Firefighters by Saturday night had managed to contain 41% of the Carr blaze, measured at 145,000 acres (58,680 hectares), and authorities were allowing some evacuees to return, Cal Fire said. Both areas remained under a “red flag warning” issued by the National Weather Service for strong winds, low relative humidity and temperatures topping 32C (90F).